We look at color a lot on this blog, but skilled designers can do good things in black and white. And that can really cut costs on the printing end of the label art process. "Thanks once again to the talents of brewing hostorian, Ron Pattinson, we can reproduce this moment in time from the original brewday document. This ‘KK’ beer is brewed with several pale malts, brown malt, caramelized brewing sugars and two classic English hop varieties, Bramling Cross and Kent Goldings. 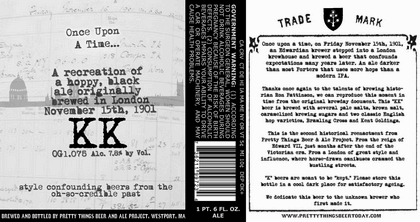 This is the second historical reenactment from Pretty Things Beer and Ale Project. From the reign of Edward VII, just months after the end of the Victorian era. From a London of great style and influence, where horse-drawn omnibuses crammed the bustling streets." 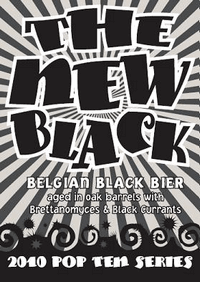 Nice name for the Belgian black, which I wish I could try here in PA. Similar motif as their other work, bu the massive black lettering and the black bottom border stand out nicely against the radiating lines. If you're not a sports fan, Cleveland built this whole "Witness" campaign around a basketball player who left for Miami this summer because he decided he'd rather play with great players in Miami than with crappy players in Cleveland. Because of this, people in Northern Ohio have decided he is a terrible person and should be punished and mocked in all forms, including beer. 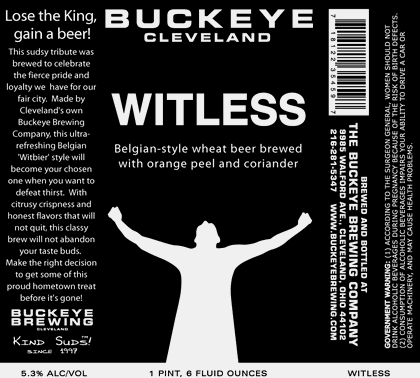 As the puns go, "Witless" is better than "Quitness," in part because it is a Wit beer. From a design standpoint, the label's pretty good. Just a simple silhouette and some sans serif font of varying sizes to take up the negative space above the screaming fan (who mirrors LeBron's pose after his signature move of throwing chalk in the air). As for the insinuation that it is somehow stupid to leave Ohio to go play in South Beach... well, we'll agree to disagree. Re: the Witless design, I dunno. I think they could have done a lot better with the silhouette. As it is, I find it unclear whether the bump at the top is supposed to be a nose (figure is looking upward) or the top of an old-style winter cap (figure is looking forward). I think we can safely assume it's the former, but they could have done a better job of making that clear. The Wide Range of Cantillon Labels.